With the (now only semi-) recent press coverage I was asked to put together an update about the Flash version of Tipping Point and talk a little bit about the board game. Over January 2009 I was asked by the lab to pull together a small team to design a board game for Sloan professor Nelson Repenning. The design goal was for the game to demonstrate the pitfalls of "firefighting" in project development. Also known as "crunch time," Repenning et al. 's research shows that when companies divert extra resources to a project that is running behind, other projects suffer and will eventually require crunch time themselves. Although companies that regularly engaged in this process were often proud of their firefighting ability, the overall result was a gradual downward spiral that was difficult to escape without drastic measures. This is of course an extremely high-level summary, but it was this general behavior that we tried to recreate in the game. The game that resulted was Tipping Point. While I am happy with the overall design, there are a few problems that we are aware of but lacking resources (mostly time) to address. First of all, the game is very abstract, and the link between mechanics and fiction is tenuous. 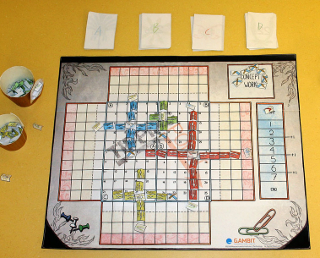 In the game each player "owns" one or more projects, and the players must all work together to finish a set number of projects in order to win. Projects are represented spatially: each exists as a growing cross on a grid. Each turn players grow their own projects one space in each direction. If any project grows to the edge of the board it is game over for everyone. If projects collide they combine into a single project that grows faster and is harder to complete. To combat this players place "concept work" or "production work" tokens on the board, preventing project growth. Once a project cannot grow it is completed. Projects then can be thought of as becoming larger and more unwieldy over time, so in a sense the game represents time spatially. While that is not unheard of (see analog clocks), the link between stopping growth (what the work tokens do) and getting something done (what they represent) is non-obvious. In playing the game it feels like you are just containing the projects, not actually accomplishing something. The projects themselves are also somewhat strange. As I said before each player "owns" one or more projects at any given time. Ownership is only used to control project growth: projects grow on their owner's turn. While in testing players tend to prefer finishing their own projects there is no real incentive to do so. In other words there is no competitive element, which at this point is the first thing I would add. If players received a score based on when their own projects were finished it would add an interesting competitive dimension on top of a cooperative design. Additionally, because of how the work tokens function the best strategy is often to delay finishing projects for several turns. Procrastination is generally not considered good project management, and is at odds with the research the game is supposed to support. All of these issues are related to the aforementioned weak link between mechanics and fiction. Simply put the game could easily be about anything at all (or just remain totally abstract) and it would play just as well, if not better. While we were certainly thinking of the research during the design, there was a certain amount of shoehorning: the way the tokens function feels right for what we were going for, but the names "production work" and "concept work" are pretty awful and obviously forced. As a result the documentation for the board game is very difficult to follow. Part of that is the terminology but also just a lack of time here as well: the rules could certainly be improved but during the semester resources are scarce. I hope to return to them at some point but right now there is no clear opportunity to do so on the horizon. At this point I personally find the tension between the play experience and fiction just as, if not more interesting, than actually playing the game. As it stands I think the game feels more like being in school than working for a company, which is a result of the way the difficulty progresses. At the start of the game each player only has one project, so there are four in total. After every other project is completed (after the second, fourth, etc.) another project is added to the mix. By the end of the game there will be seven projects on the board at the same time. This works well in that it motivates a certain behavior, but feels more like being in school: as the semester closes the work load ramps up, just as in the game. During my various stints in corporate America I never had quite that experience. Certainly there were busier times than others, but never the same type of extreme ramp-up (adding projects / final exams) followed by a complete stop (winning the game / end of the semester). Having said all this, I do think it is an interesting game. It is something more of a puzzle than most board games I am familiar with, and the gameplay creates an interesting group dynamic. Because new projects are placed semi-randomly much of the time playing is spent in discussion and planning as players try to determine who should be doing what and when as players balance between focusing on current projects and preparing for the placement of new ones. Discussion becomes such a focus it caused us to include a "turn token," basically a piece of paper the players pass around so they can remember whose turn it is. I personally still enjoy playing it and am proud of the game and the team. Reactions around the lab were generally positive as well, which lead to the development of the Flash version over the Spring 2009 semester. As it stands the Flash version is much more abstract, using very iconic graphics designed more with usability in mind. For example, in the board game concept work tokens are pencils and rulers, while in the Flash version they are just black circles. This version has not been playtested outside of GAMBIT's QA department, so what difference these graphics will make is currently unclear. I personally am looking forward to seeing player reactions, as my thesis research concerns abstract games and how they are interpreted. Despite the game's shortcomings, overall I am happy with the design. While playtesting I never got tired of playing, and would find myself forgetting to look for bugs and instead focusing entirely on my strategy. I hope you find it just as enjoyable.